St. Patirick’s day is just a couple of days away. I will have to be honest, I never really get too excited about St. Pats. I normally don’t even bother wearing green. However, I do get excited about mint & chocolate. It is one of my favorite flavor combinations. I normally don’t need an excuse to pair these two flavors together, but I guess St. Pat’s is a good one. Preheat oven to 350 F. Line standard muffin tins with paper liners. In a mixing bowl whisk together flour, cocoa, sugar, baking soda, baking powder, and salt. Add eggs, buttermilk, oil, vanilla and water. Beat on low speed until smooth and combined. 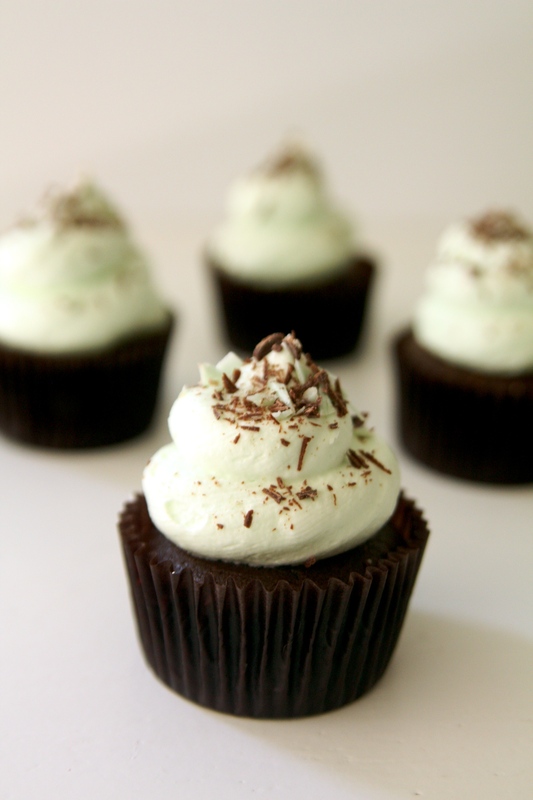 Add chocolate chips if desired, I love them with the mint frosting! Divide batter evenly among lined cups, filling each about two-thirds full. Bake about 15 minutes or until center is set. Cool completely. Cream together butter and shortening on medium speed. Add milk. Slowly beat in powdered sugar until combine. Add peppermint, if using peppermint flavoring you may need to add more than if you are using pure peppermint. Add green food coloring, if desired. Using a decorators bag, pipe frosting onto cupcakes. Garnish with shaved chocolate or Andie’s mint candy. I love these when they have been chilled. To me the mint and chocolate flavors pop even more.